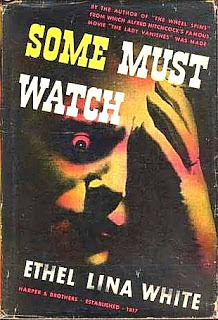 Ethel Lina White’s suspense novel Some Must Watch was published in 1933. In the 40s it was filmed as The Spiral Staircase and subsequent editions of the novel bore that title. I was quite unimpressed with White’s The Wheel Spins (filmed as The Lady Vanishes) but since I own the Wordsworth edition which includes both novels in a single volume it seemed sensible to give this author another chance. The heroine, Helen Capel, is employed by an odd family in a very remote house called The Summit. The house, located near the border between England and Wales, has an unfortunate reputation having apparently been the scene of several murders. And now there’s a homicidal maniac roaming the district, strangling young women. There are things that are even more frightening than stranglers, such as old Lady Warren (who may or may not have shot her first husband). Her middle-aged son Professor Warren seems harmless enough. His unmarried sister seems decidedly strange. And then there’s the Professor’s son and his wife. This is not a marriage made in heaven and the young Mrs Warren has consoled herself with a series of young men. Now she has her eyes on the Professor’s pupil Stephen Rice, currently staying at The Summit. When the young Mrs Warren decides to pursue a young man she does not expect to be rejected but Stephen has made his lack of interest all too obvious. The other inhabitants of the house are Lady Warren’s new nurse, the formidable and rather unpleasant Nurse Barker, and the two servants, Mr and Mrs Oates. The only regular visitor is the young Welsh doctor, Dr Parry. The events of the novel take place on a dark and stormy night. As if that’s not enough to isolate the inhabitants of The Summit, on Dr Parry’s advice strict orders have been issued that no-one is to enter or leave the house until morning. This applies especially to the men, who have a duty to protect the women from the strangler. The strangler seems to be moving closer and closer to The Summit with each murder and everyone assumes that his next victim is likely to be one of the women in the house. This book is very much in the Had I But Known mould. There’s nothing wrong with a bit of foreshadowing, in fact in a suspense story it can be quite a desirable thing, but it’s a technique that needs to be handled with care and subtlety. White uses it in a particularly clumsy and obvious way and all it really does it to draw attention to her inability to build suspense effectively. The basic structure is similar to the classic English country house murder mystery, with a small circle of suspects cut off from the outside world, but played for suspense rather than as a fair-play puzzle-plot mystery. While there are clues, and there are red herrings, nobody does any actual detecting and the solution is stumbled upon by accident. Being a Had I But Known novel there is of course a romance sub-plot. I’m not surprised that White’s novels were filmed, and filmed very successfully. She was quite good at assembling the ingredients for a fine mystery suspense story. It was her execution that was lacking. Her prose style is clunky, she has no ear for dialogue, she tells us directly what the characters are thinking rather than letting their words and actions tell us, and there’s that heavy-handed foreshadowing. These are all flaws that a good screenwriter could easily correct and the basic stories had plenty of potential in the hands of a really good director. And Alfred Hitchcock (who directed The Lady Vanishes) and Robert Siodmak (who directed The Spiral Staircase) were very very good directors indeed. In fact it’s a peculiarity of the thriller that some of the best movies in that genre have been based on mediocre source novels. And Some Must Watch definitely qualifies as a mediocre source novel. Hard to recommend this one. "In fact it’s a peculiarity of the thriller that some of the best movies in that genre have been based on mediocre source novels." Your comment about telling directly what characters are thinking reminds me of one of Elmore Leonard’s best rules for writers: Dialogue belongs to the characters . Just report it don’t explain or characterize it.